My name is Taylor Rogers, pitcher for the Minnesota Twins. Growing up my dream was always to become a professional fire fighter and continue the family name in the fire service for a 5th straight generation. Since becoming a Major League Baseball player prior to that dream, I wanted to give back to the fire fighters in my home state of Colorado and my 2nd home of Minnesota. With the help of the Colorado, Minneapolis and St Paul Professional Fire Fighters, I was able to identify a need for mental wellness in the fire service. Not just financially but also for awareness. Like our military veterans it is difficult for these heroes to admit or overcome the stigma of PTSD. More Fire fighters die from suicide than from the incidents they respond on. My goal is to raise money and awareness for the Colorado, Minneapolis and St. Paul Professional Fire Fighters to help them get the care they need to take on PTSD that they obtained in the line of duty. Starting with my donation of $10,000.00 and the help of the fire fighters, the Twins and the MLB players association, lets help the first responders who so willingly help us every day. Please use donation site below, all proceeds will be donated to Fire Fighters in need. 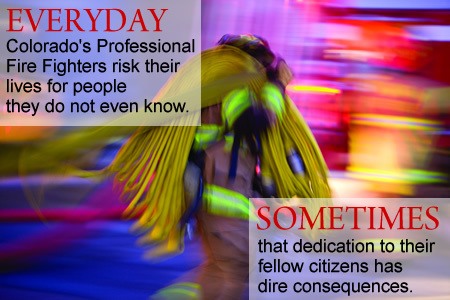 The Colorado Professional Fire Fighters Foundation was founded in January 2002 by members of the Colorado Professional Fire Fighters who recognized the tremendous void left in the lives of Colorado fire fighters when tragedy strikes. The founders realized the men and women who sacrifice their lives, or are injured while saving others, leave families with very real emotional and financial needs. Support our Fire Fighters Today!